Code First: Girls (CF:G) is a Not for Profit Social Enterprise that trains women in IT skills and helps companies to develop more female‑friendly recruitment policies. The organisation promotes gender diversity and female participation in the technology sector by offering free and paid training and courses for students and professional women. It also supports businesses to train staff and develop talent management policies. 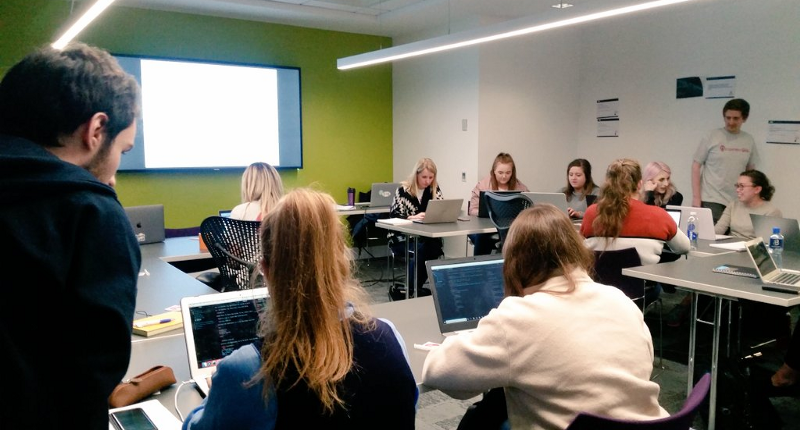 I got involved with Code First: Girls through QUB (Queens University Belfast), where I took part in both the Beginners’ and Advanced courses. I really enjoyed the courses, and I liked the environment it created where women who had no coding experience could come learn to create something, and feel comfortable asking questions. The following year I instructed on both courses at QUB and I realised the entry criteria was very limited, meaning a lot of talented women were missing out. So, I started organising a new Code First: Girls, the first in Belfast open to female students and professionals. I was delighted when Liberty IT agreed to host the course in their modern Belfast offices. When I was at school, I didn’t study IT beyond 3rd year because it was so boring! Only when I signed up for a 3 day ‘crash course in Java’ by Ulster University did I begin to understand what programming was, and what might be involved in a computer science degree. And I enjoyed it! Taking part in that course made me take another look at the tech industry and software engineering as something that could work for me. Now, with the knowledge that I’ve gained, I want to do my bit so that opportunity is within arms reach for all women. · According to the National Center for Education Statistics, in the 1984–1985 academic year women accounted for nearly 37% of all computer science undergraduate students, compared with only 17.6% in 2010–2011. · Furthermore, the percentage of women working in computer science-related professions has steadily declined since the 1990s, dropping from 35% to 25% in the last 15 years. · Computing makes up 58% of available STEM jobs, while only 8% of STEM graduates are in computer science. · In a 2015 report from McKinsey & Company, analysis of companies in the top 25th percentile for gender diversity on their executive teams were 15% more likely to experience above-average profits. The latest data shows that likelihood has grown to 21%. All of these factors combined is leaving increasing amounts of roles unfilled, and those that are filled lacking diversity, when we can clearly see a company benefits from increasing the diversity of their workplace. Through CF:G I wanted to give women with a range of experience, skills and tech knowledge a taste of creating a small project with code. And the results speak for themselves, with a number of participants from the first iteration of the Belfast General course saying they would love keep building that momentum and switch into a career in tech. In 2017, Code First: Girls announced the launch of the “Code First: Girls 20:20 campaign” with the aim to “train 20,000 women to code for free by the end of 2020”. As of 2018, Code First: Girls is reported to have provided in excess of £3 million worth of free coding courses to more than 5,500 women since 2013. Join the initiative — become an instructor, a course ambassador, or start your own! Get in contact with me, info@codefirstgirls.org or fill out a contact form here. Build your CV, confidence and teaching skills! Applications haven’t opened yet, but you can register your interest for the Belfast General course here or join our Facebook group and be notified when they do! Big thank you to my fellow instructors Lauren Little, Jordan Jones, Peter Hughes & Kevin O’Hagan​. You have all been great mentors, thanks for giving up your personal time to help others! Thank you to Gillian Armour, Lesley Wilmot & Victoria Callum for helping provide feedback on the student’s projects the final evening. Thanks to Liberty IT for hosting the course. And of course thank you to the students for taking part — I hope you have gained as much from this experience as we have!